The best way to make a realistic face mask is to start with a real human face. Have a partner work with you. If you are the person who will wear the face mask, ask your partner to build the mask on you. You can also purchase plastic face molds to build realistic face masks on, but the best and most realistic fit is made with your own face. Cut plaster bolt into strips about 6 inches long and 1 inch wide. Cover your face with Vaseline. Have a friend help you. Dip the plaster strips into the water, and lay evenly on your face. Only put the strips where you want the mask to be. Leave holes around your eyes. 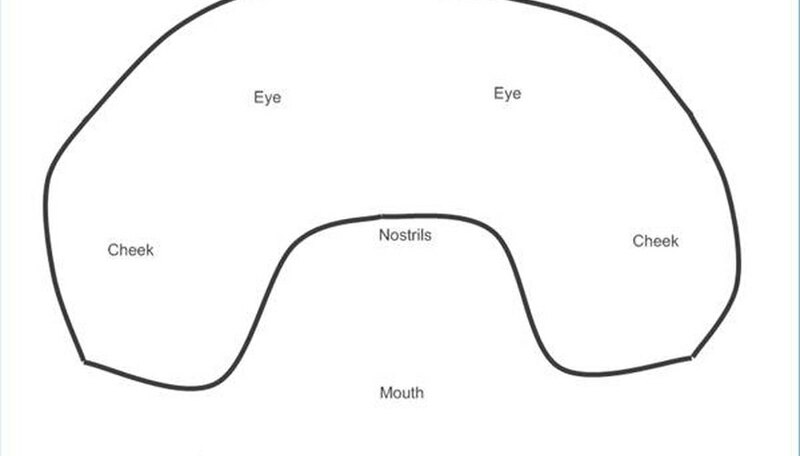 One option is to cover your cheeks, but only cover to the end of your nose (see illustration). You may choose to cover your mouth and chin, but this mask's mouth will not move later. Plaster two smooth layers of strips to your face; make sure they are not wrinkled or bumpy. Relax with a good book and wait to dry. Carefully pry the dry mask off, and wash your face well with warm water and gentle soap. Paint your mask a flesh color. Let dry. With more paint or even a little make-up, give the cheeks some color. Paint on the eyebrows. If you have made a full face, color the lips. Glue false eyelashes to the edges of the eye holes. Wait to dry, and then trim them if you see fit. Cut the hair off of a wig, or purchase doll hair from a craft store. Style the hair and glue it to the top of your mask. This hair can also be used to create eyebrows. If you have made a full mask, you can use wig and doll hair to fashion a mustache and/or beard, and attach with craft glue. Wait to dry. Very gently and carefully poke one small hole on each side of the mask, nearest your ears, with a large needle. Thread thick, plastic-coated thread through these holes. Thread the needles through the ends of a piece of elastic, and tie with knots. The elastic should be short enough to give your head a tight fit. This optional step enables you to wear your mask without holding it on.